I hate to break it to you, but if all goes well you will be 80 soon. Actually, sooner than you can accurately imagine. Many a research study has been devoted to the gap between chronological age and a person’s psychological impression of their age. Remember, if all goes well, you will be 80 sooner than you can imagine. What’s really important? Yikes, I know that is not a question I like answer on any given day because usually I become concerned I am investing my time in the wrong places! Dr. Success Challenge: Find someone in their 80’s. That should not be hard. Now, have a meaningful conversation and ask, “Knowing what you know now, what is important to you today?” The difficult part of this challenge is truthfully asking yourself if what they responded even makes it to your radar today. Just something to think about. Personal footnote: I am 50% through Unforgettable and it is one of the most enjoyable books I have read in a long time. I suggest getting the Audible version. 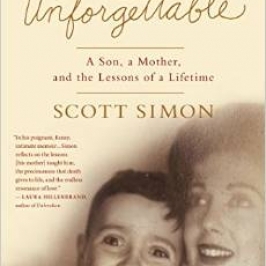 Listen to Scott Simon read the story makes it all the more Unforgettable. Resource: WCIU, The U 040815 http://www.wciu.com/videos/youandme/scott-simon-from-npr Hint: stay with this interview until you hear about when his Mom was a hand model! Priceless!